Roasted Garlic Achaar for sale. Buy online at Zingerman's Mail Order. Gourmet Gifts. Food Gifts. The folks at Brooklyn Delhi have a knack for creating versatile condiments called achaars you’ll want to use in every dish at every meal (check out their Tomato Achaar). Achaar is the catch-all term for pickles made in India. Traditionally you'd serve achaar with rice, curry or dal. 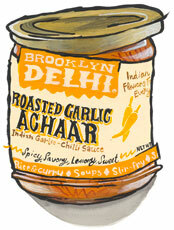 You can make some delicious dips and marinades with achaar by mixing it with yogurt. This particular achaar is made from oven roasted garlic, lemon oil, a blend of Indian spices along with a bit of sugar and chili powder, to make a chunky spread. Flavor-wise, it’s got a big garlic punch, then a note of "spicy-lemon-sweet-rich-bright." It’s everything at the same time, all those sensations all at once. Wicked stuff. You could use it in any of the traditional ways, but don't stop there. Eggs, pasta sauce, sandwiches, pizza, salsa, morning toast, garlic bread, you’ll want to use it everywhere.